Trekking in Switzerland is both uniquely difficult and uniquely easy. Difficult because of the inherent nature of the terrain: rugged, relentlessly steep, with great changes in altitude both up and down in a typical day’s walk (there’s a reason why the Swiss love Nepal, it reminds them of home!). Easy, because high mountain villages with their rustic hotels and lodges, as well as mountain huts built to serve climbers and hikers, allow you to carry only a light daypack for a multi-day outing. The occasional “assist” by cable car or cog rail train, or a short drive up a herdsman’s alpine service road, reduces what would otherwise be a back-breaking elevation gain to a more reasonable daily dose of exercise. The trek from Grindelwald to Leukerbad is a superb example of how in just a short week’s vacation you can get up close and personal with some of Switzerland’s most famous and impressive peaks, explore high passes and alpine meadows and farms (and even check out local cheese makers’ goods and their on-site “factories”), challenge yourself physically and mentally and truly get away from it all, while still enjoying the comforts of a civilized night’s sleep and a fine meal every night. Our itinerary takes us from Grindelwald and Kleine Scheidegg, famous staging area for the first ascent of the Eiger’s notorious North Wall; through the beautiful Lauterbrunnen valley with its free falling waterfalls; to the small cliff-hanging village of Mürren; over the barren and rugged passes of Sefinenfurge and the Hohtürli; through the outdoor sports mecca of Kandersteg, finally crossing the cantonal border from Bern to Valais and over the historic Gemmi Pass, to end in the spa village of Leukerbad. Those wanting still more challenge can stay on an extra three days to spend a night at a climbers’ mountain hut, climb their first glaciated alpine peak on the Wildstrubel, and pass back into the canton of Bern to end the trek in the resort town of Adelboden. 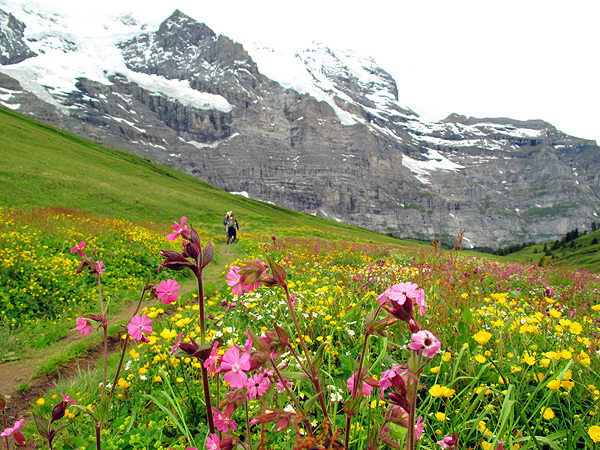 Alpine meadows near Kleine Scheidegg. Guiding fees are the same for either an open trip or a private trip here. Kathy will be leading our trip for 2016, and can take a maximum of 8 trekkers for Part 1. For Part 2, the climbing ascent of the Wildstrubel, we have a maximum climber to guide ratio of 4:1. We can add more guides if more than 4 want to climb. While this trek is almost exclusively on well marked and frequently travelled trails, some sections entail steep talus or scree, and can be narrow, rugged, poorly maintained and even exposed to severe consequences of a stumble or fall. While distances and elevation changes on most days are moderate, elevation gains and/or losses on a couple of the days are in excess of 1400 meters (4500 feet). Depending on the weather and the season, some snow patches may persist in shaded areas, creating some sliding hazard. For participants opting for the Wildstrubel add-on, we will be crossing a glacier that is at least partially snow covered. Crevasses, though not very big or problematic, will exist on our route and we will travel roped together on the glacier for that reason. 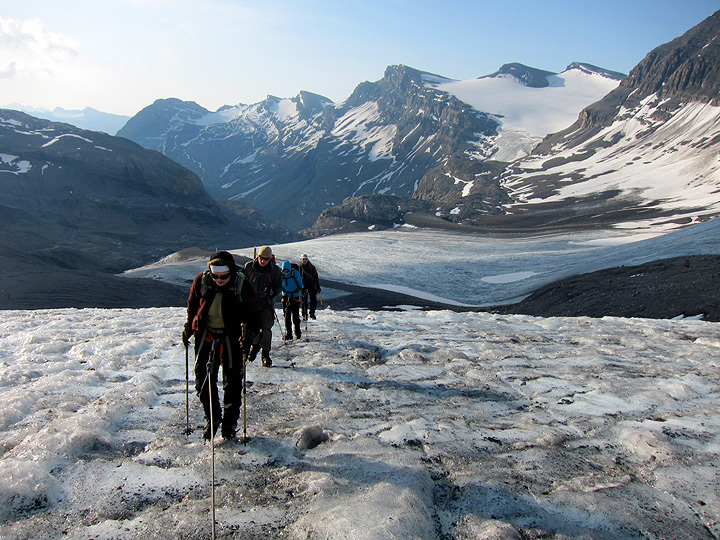 Other typical hazards on this section of the trip include some potentially unstable rock and swiftly running water; loose boulders; low-angle but uneven bare glacier ice; steep talus and scree. This trip is recommended for seasoned hikers and backpackers with prior experience on mountainous and/or steep, sketchy or rugged trails. Confidence in your footing and balance, even on unstable ground; agility, a head for heights, strong legs, and an excellent level of aerobic fitness and endurance, are needed for safety as well as enjoyment of this very challenging itinerary. As a rough gauge, you should be able to hike uphill at a pace of at least 1000 feet of elevation gain per hour including rests, for at least three hours, carrying a light pack. 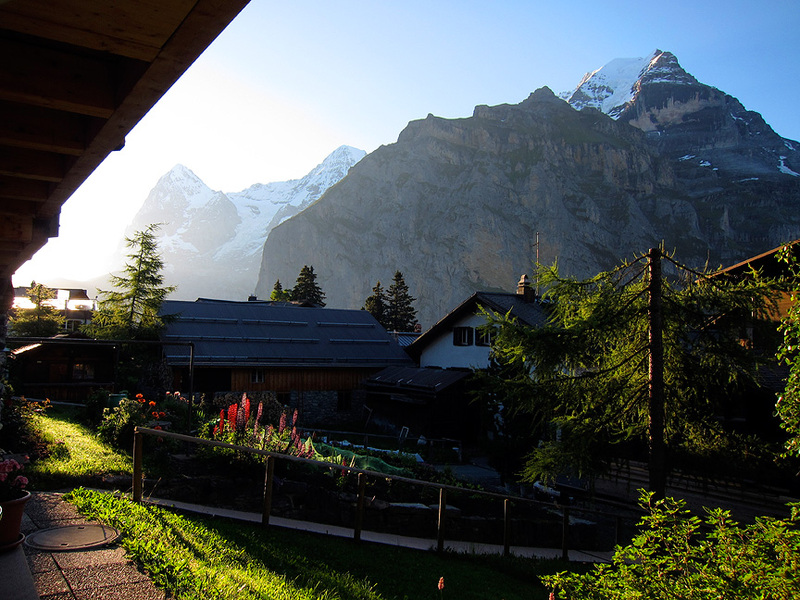 Evening rendezvous in Grindelwald, night at hotel. We will meet at our hotel in the early evening to go over the logistics, weather forecast and itinerary, check gear and clothing, and generally begin to get acquainted. 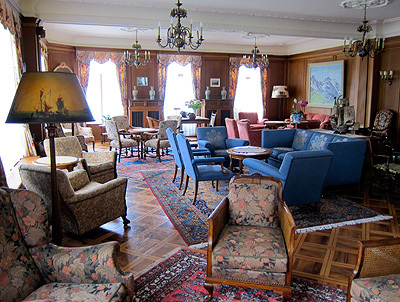 Hotel Bellevue des Alpes, Kleine Scheidegg. Ride the cable car to Männlichen, hike to Kleine Scheidegg. Afternoon hike down Eiger trail to Alpiglen station and train back up to hotel at Kleine Scheidegg for the night. Our journey begins with a ride up the Männlichen cable car to the ridge-top station at 2230 meters, or 7314 feet. From there our trail follows the ridge southward at first along the crest, then traverses high alpine meadows below the rugged cliffs of the Tschuggen, to Kleine Scheidegg. After checking in to our hotel there, and possibly having lunch, we can either relax in the luxury of the beautiful historic Hotel Bellevue for the afternoon, or we may continue walking up more meadows to the Eigergletscher station of the Jungfraujoch railway, and from there descend the Eiger Trail, in the shadow of the Eiger’s North Face, to a little restaurant at Alpiglen. After a snack and cup of tea or stein of beer, we will take the cog rail train back up to Kleine Scheidegg, for dinner and bed. Hike to Wengen, descend by train to Lauterbrunnen. Ride tram to Grütschalp and hike to Mürren, night at hotel. Today’s walk begins by descending flowery meadows, through sub-alpine pine and larch forests, into tamer “cow country” and finally to the mountain town of Wengen. We may check out one of the small cheeseries along the way. From Wengen we will catch another cog rail train to the valley bottom at Lauterbrunnen. We may have lunch here, or explore the base of one of the dramatic free-falling waterfalls that make this valley famous. A short cable railway ride then brings us up to Grütschalp, whence another hour or so of walking on nearly level, comfortable trail (leaving us free to gawk at still more spectacular views of the Eiger, Mönch, Jungfrau and adjoining peaks) brings us to the car-free village of Mürren, accessible only by mountain train and cable car. Hike over Sefinenfurgge pass to the village of Steineberg, night in hotel. This day constitutes our first big challenge of the trip, with 1000 meters (in excess of 3200 feet) to ascend, and almost 1200 meters (3700 feet) to descend. Our trail leaves town and quickly becomes steep and rugged, before briefly leveling off at Poganggen. The respite is short however and our path climbs again, becoming quite rocky and abrupt, with perhaps a snow patch or two to negotiate as we approach our high point at the Sefinenfurgge (2612 meters, or 8567 feet). The steep scree on the backside of this high pass is made considerably less intimidating by some improbable-looking (but very helpful!) wooden ladder rungs nailed into the slope. The trail becomes ever tamer as we descend back into meadows, past yet another high alpine dairy, and eventually to the road at Steineberg, where we gratefully check in to our cozy mountain hotel. Taxi to Oberi Bundalp; hike over Hohtürli to Oeschinensee, night at mountain hotel. Another very big day awaits us. We will get an assist by car for the first 400 meters (1000+ feet) of elevation gain through the woods, and begin our hiking above treeline. All the same we have more than 1000 meters of elevation to gain before crossing the Hohtürli, then another 1300 meters (4200+ feet) of steep and rugged ground to descend to our lodging beside the beautiful lake of Oeschinensee. Ride the Kandersteg-Oeschinen cable car to Kandersteg; bus to Eggeschwand, hike or cable car to Sunnbüel, hike to Schwarenbach hotel. After the previous two days’ efforts, we can take it a little easier today. We begin with a short walk to the cable car, which will take us down to Kandersteg. We may opt for a little clothing change here, if we planned ahead, as the Swiss rail company has a baggage forwarding service. We can pick up bags sent ahead from Grindelwald a few days earlier, and send along our dirty clothes to re-join us in a couple of days. A short bus ride then takes us to yet another cable car at Eggeschwand. Here we have the option of either walking or taking the cable car to Sunnbüel (another 700 meter, or 2100+ foot climb). In either case, from Sunnbüel we have about an hour’s walk on a gentle broad path, to our lodging at the rustic mountain hotel of Schwarenbach. We cross the canton border from Bern to Valais shortly before reaching the hotel. • total ascent 230 m (745 ft) if taking the cable car to Sunnbüel, 961 m (3152 ft) if walking up. Hike from Schwarenbach hotel to Gemmi pass, then ride the cable car down to Leukerbad. Night in hotel, and end of trip. Another relatively easy effort on this our last day. We follow the gentle broad path past the lake of the Daubensee to the famous Gemmi Pass. From here we take the cable car down to Leukerbad. We should have plenty of time to relax and soak in the natural mineral hot springs that put this village on the map. A final dinner and night together at a hotel in town, and it’s time to say good-bye. Wildstrubel climb! And night in a mountain hut. Logistical note: for those continuing onward, we will have planned ahead and before leaving Grindelwald, we will have sent climbing gear from there to Leukerbad, via the Swiss rail's baggage forwarding service. We will pick up our climbing gear in Leukerbad on the afternoon of day 6, and re-pack our bags for the next three days' trekking and climb. Any unwanted items for the next few days can be forwarded onward, either back to Grindelwald, to Adelboden near our ending point, or to any other Swiss town you may be headed to next. From Leukerbad, we take the earliest cable car back up to the Gemmi pass. From here we hike 2-3 hours to Lammeren hut (a rustic climber's hut; no showers or potable water, but providing a comfy bunk and a good meal). We can leave here a few items not needed for our climb: toiletries, extra food or clothing. After a quick snack and a bit of a rest, we continue on to the Wildstrubel. Our climb begins by following a rough climber’s track to the edge of the glacier, where we don crampons and rope up for the climb. Traveling together on the rope, we climb moderately steep slopes of ice and snow to the rocky summit on its narrow ridge, at 3243 meters (10,637 feet). Distant snowy peaks and steep drops into the nearby valleys will keep us gawking here for a while. The climb will likely take us 5 hours or so round trip from the hut. We'll return to there in time for dinner and a deep, long night's sleep! Hike over Rote Totz Lücke and Chindbettli Pass to Engstligenalp, night in hotel. After a light breakfast alpine hut style, we begin this day on more rough paths up the high valley of the Lammerental and over the remote Rote Totz Lücke pass. We then descend the easy Tälli glacier, have one more short easy climb up to the Chindbettli pass, and then it’s a steep and long descent to our hotel at Engstliggenalp. A big day and a real challenge due to the un-maintained, discontinuous nature of much of the the track through this remote and rugged region. 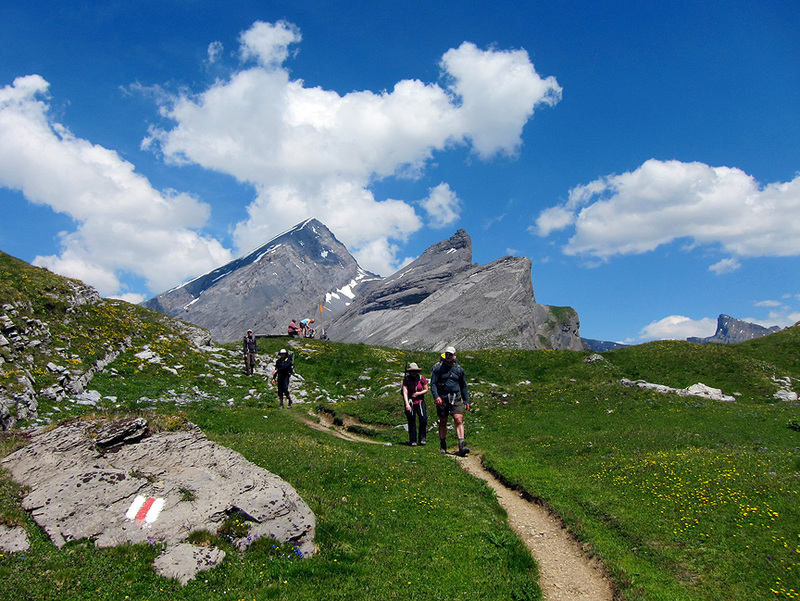 Hike down to Unter dem Birg, bus and train back to Grindelwald and/or elsewhere. End of trip. We can sleep in on this, our last morning. We have only to descend the trail that winds down past the truly spectacular Engstligen waterfalls. All too soon we will be at the road end, where a bus and train take us back to Grindelwald, or wherever our wandering feet want to take us next. En route to the Lammeren Hut.